Updated Material! New Delivery Format! NOTE: Lunch is provided with the public workshop session. 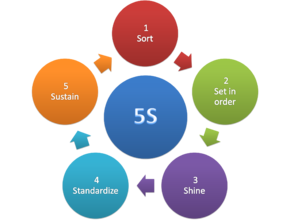 5S (Sort, Set in Order, Shine, Standardize and Sustain) is a proven, effective way to identify and eliminate wasteful (non-value adding) practices from your workplace. Created and initially perfected by Toyota, it incorporates a system of visual cues that help reduce waste and achieve more consistent operational results by attaining and maintaining an orderly workplace. 5S is increasingly being used by all types of businesses and organizations, including manufacturing plants and offices, health care and financial institutions, higher education, the military and more. 5S also assembles the foundation of a successful Lean implementation, making possible the use of other powerful Lean techniques and tools. Standardized work cannot be achieved without good 5S. Just-in-Time becomes deficient if 5S is done poorly. And an effective Lean culture cannot be created without a 5S mentality. This VMEC workshop, with its new delivery format, is designed to both introduce you to the 5S System and provide on-site coaching to help you learn 5S implementation steps, so you can begin to evaluate and audit you own company or organization. Part 1: A 4-hour classroom presentation and activities in a multi-company public workshop venue. Part 2: A 4-hour session at your company to get you started with a 5S project. The second 4-hour session is typically scheduled to take place within 6 weeks following the first half-day classroom session. A VMEC Professional Manufacturing and Business Growth Advisor comes to your company and coaches the workshop participants to take the first steps in applying what they have learned to their work area. This second portion will serve as a coaching session where we would look at your company's specific 5S needs and make recommendations so you and your team are able to implement suggested steps. Let VMEC experts help you organize your work spaces for greater efficiencies and savings. Bring new order to your work place in 2019!